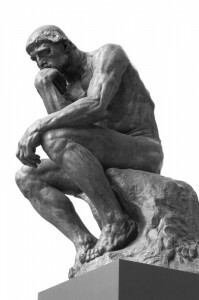 Home » Blog » How Great Strategic Thinking Leaders Think. How Great Strategic Thinking Leaders Think. The Finale Says It All. Overwhelmed by an overload of demands, not knowing what to respond to first? Continually fighting for certainty, paralyzed by fear of the unknown? Blind sighted by unforseen events that jeopardize your company’s stability and bottomline? I’m guessing what you really want is to stop your perpetual busyness. You want to focus on the critical few. You want to navigate your company, amidst constant change, to its ultimate destination. In my decades of working with leaders, I have found that the above are symptoms that a leader lacks the capacity to think strategically. Let’s look at how to turn those symptoms around. 1. Strategic thinking is an exercise of the brain muscle, not the wrist muscle. Despite what many leaders believe, strategic thinking is NOT quantitative analysis – eg, generating sales forecasts – nor quantitative goals – eg, $100 million in revenues. While numbers are important in planning, true strategic thinking is qualitative. It is about HOW you think as a leader, and less about the contents of your thinking. 2. Strategic thinking is NOT the same thing as strategic planning. In fact, many strategic plans have little strategic thinking behind them. For most companies, strategic planning focuses on breaking down a goal into action steps and connecting those steps to resources, timelines and budgets. While strategic planning is an important activity for implementation, a plan, without strategic thinking preceding it, has little chance of success. While strategic planning defines the steps to move up the ladder, strategic thinking (in the words of Covey) defines whether your ladder is against the right wall. 3. Strategic thinking is more about the structure of one’s thinking, NOT the content of one’s thinking. While most strategy development efforts focus on content – or what one thinks, strategic thinking is driven by how one thinks – ie., the thinking behind the thinking. We call this metacognition. For example, assessing a competitor’s strengths focuses on content. While the structure of your thinking may view competition at a higher elevation, such as the changing forces in one’s industry and impact on the competitive landscape. Essentially, strategic thinking is a mindset. It is the art of making the right decisions for attaining future success in a complex, uncertain world. Although there are many books about strategic thinking, my focus for this article is on the structure of strategic thinking … the Core 6 characteristics. To uncover a leader’s strategic thinking capacity, I utilize a tool called the Inventory of Workplace Attitude and Motivations (IWAM) to assess a leader’s strength in the Core 6, as well as dominant mental patterns blocking a leader from thinking strategically. Below are my Core 6 characteristics of strategic thinking. Big picture thinking (ie, seeing the overall landscape from a 10,000 foot level … such as your organization or industry. The purpose of holistic thinking is not to accumulate knowledge, but to create new mental maps that unleash greater thinking possibilities for the future. Example of Holistic Thinking: Bill Gates and Paul Allen did not invent anything to start Microsoft. The personal computer revolution was started by putting together existing technologies in a way never done before. They could see from a 10,000 foot elevation how seemingly unrelated technology trends intersected, eventually disrupting the computer industry in a completely new direction. What new emerging trends will shape our company’s future? What new possibilities may exist 10 years from now that don’t exist today? What unmet needs will our customers have in the future, not even visible on their radar screen today? Strategic thinking requires a mindset that anticipates rather than reacts. A strategic minded leader is seeking out opportunities through a “future” lens rather than merely responding to today’s problems and customer needs. Henry Ford, a leader with great strategic foresight, understood that principle. He said if he had asked his customers what they wanted, they would’ve asked for a faster horse. Options thinking is nothing new. Our whole lives consist of endless options – what will we eat for dinner, where will we invest our money and so on. The same is true for organizations. Identifying a wide range of possible future states (aka environmental scenarios) to uncover and exploit emerging opportunities. To understand why, imagine, if you picked a random path up a mountain – rather than finding the easiest among multiple alternatives. Or that you did not consider various conditions in your climb – like snow, dangerous animals or equipment failure. What would be your chances of success? In a similar fashion, many strategic plans fail within organizations due to lack of options thinking. Example of Options Thinking: In 2006, Mike Jackson, CEO, AutoNation, challenged industry assumptions by asking “what if buyers replaced cars every 5 years, not 3 years?” By looking at a low probability, high consequence event, AutoNation experienced profitability and positive cash flow, while many dealers went out of business. That’s the advantage of options-thinking. His/her brain is wired to sort for differences. These leaders are innovators. They love to change the rules of the game. Think Steve Jobs as a “high differences-oriented” leader. They thrive on change. Not only can these individuals respond easily to change. They can “see” possible changes in the future that others may dismiss or think impossible. Such leaders have the ability to see and capitalize on hidden opportunities that others don’t have the thinking capacity to spot. Example of Differences-Thinking: Billy Beane, General Manager, Oakland A’s, shattered conventional baseball beliefs that big payrolls translate into big wins. His unconventional use of statistics in identifying undervalued players led the A’s — one of the worst teams in baseball with one of the lowest payrolls — to three American League West division titles. This is hallmark of a differences-oriented thinker. An achievement-thinking leader is an individual who is motivated by success and by being the best. Achievement-thinking leaders choose strategies that exploit an advantage. Their only goal is to win. What are the factors that drive success? Example of Achievement-Thinking: Olympic athletes are the quintessence of achievement-oriented thinkers. Their whole focus is on winning the gold medal. For many, even a silver or bronze medal is considered failure. They seek every possible strategy to get the advantage: the choice of a coach, equipment, mastering the fine points of technique, etc. Most leaders by nature are highly proactive and take little time for reflecting. Yet, to solve the increasing unfamiliar problems facing businesses today, a leader must learn to balance (proactive) action with reflection for new insights to problems with no precedence. This balance requires leaders to take regular time for reflection and cultivate a sense of right timing for action guided by one’s own intuition. Learn chess. It is one of the best ways to develop the strategic thinking characteristics described above. Subscribe to the Futurist magazine published by the World Future Society. Track the BIG, new things the smartest people & organizations (regardless of industry) are doing. Then adapt them in your company. “Play not to lose” less. “Play to win” more. Posted by Denise Corcoran on March 4, 2014 in Change Management, Fast Growth, Goal Achievement, Leadership Performance, Mindset, Motivation, Organizational Performance, Organizational Transformation, Strategic Thinking and tagged achievement, brain, business success, cognitive abilities, future oriented, global, inner leadership game, mindset, neuroscience, organizational performance, play to win, reflection, strategic thinking.